Plot: A spoiled rich girl is brought down to earth by the man who loves her. 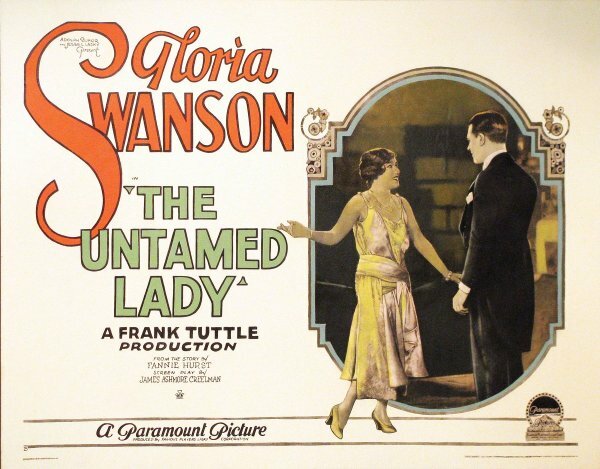 The Untamed Lady received poor reviews from the critics and Swanson herself felt that the studio was just trying to make money on her name alone. The usual lavish expense was not lauded on this film as Swanson's previous ones and the absence of director Allan Dwan was sorely felt. Frank Tuttle, a former screenwriter (he worked on Manhandled) was hired as director and his experience was minimal. Swanson decided to learn as much as she could about filmmaking on this movie because she felt she would need it when she became her own producer. She claimed that she even directed some of the scenes herself.